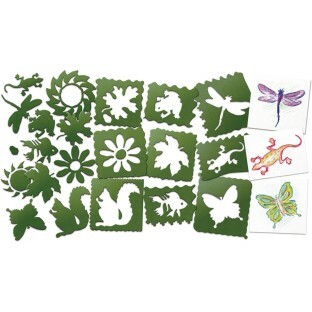 Fun nature stencils will bring God's Big Backyard to your projects. Use stencils to make fun designs on all the Color-Me products. Trace them or paint them, either way kids will create fascinating objects of nature such as leaves, a gecko, a squirrel, frog or fish. Even the edges are designed for stenciling into animal art. Size: 7-3/4" x 7-3/4". 10 stencils per set. These stencils were large. They were easy to use and made of heavy plastic. I'm probably going to use these stencils to trace designs for my embroidery crafts. My only complaint is that it didn't come with a storage container. I like the animals And sizes. they are very neat and big enough. We used stencils at camp for our crafts time. These stencils were perfect because they are a sturdy plastic that can easily be cleaned. The campers used them daily and all we had to do was wash them off for them to be as good as new. This is a great product. 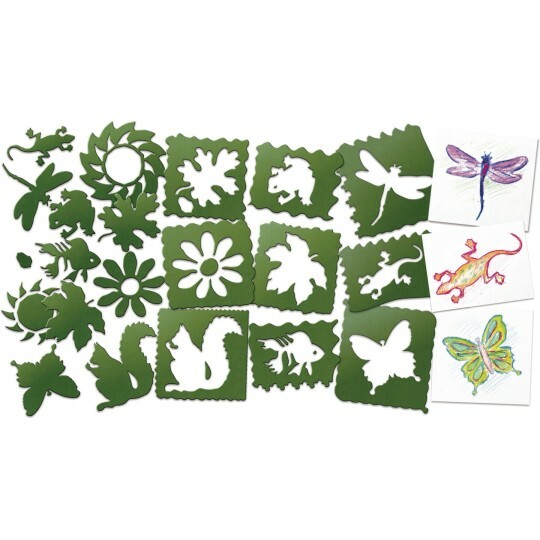 These stencils allow my two year olds to produce a piece of art work on their own in a variety of mediums! Whether we paint use chalk or use crayons they are able to say I did it. You cld also glue tissue papercereal...be creative!